Triumphant with his team as Portugal claimed the UEFA EURO 2016 trophy on Sunday night, Renato Sanches also received a prestigious individual honour after he was named Young Player of the Tournament. FC Bayern München’s 18-year-old midfielder was awarded the accolade in the hours after Portugal’s dramatic extra-time 1-0 win over host nation France in the EURO 2016 final at Paris’ Stade de France. Sanches began the campaign as one of coach Fernando Santos’ reserve players, but quickly forced his way into the starting XI after starring in Portugal’s extra-time victory against Croatia in the last 16. He started an international game for the first time in the subsequent round against Poland – finding the net to become the competition’s third-youngest ever goalscorer – and he was again impressive as his team saw off Wales in the semi-finals. He also played 79 minutes of Sunday’s final. Chosen by a panel of experts including former Manchester United FC coach Sir Alex Ferguson and French EURO ’84 –winning midfielder Alain Giresse, Sanches edged out his Bayern team-mate Kingsley Coman (aged 20) and fellow Portugese Raphael Guerreiro (22), who recently signed for Borussia Dortmund. 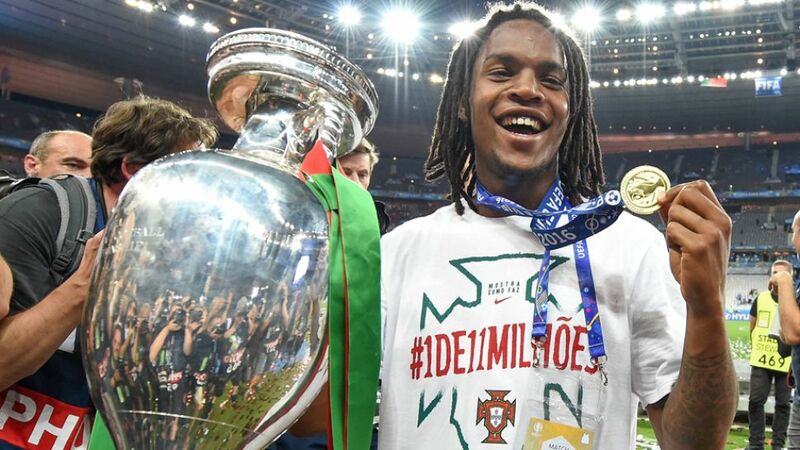 The victorious campaign marks quite a season for Sanches, who began the season in the SL Benfica reserves, only making his senior club debut last October and his international debut in March.